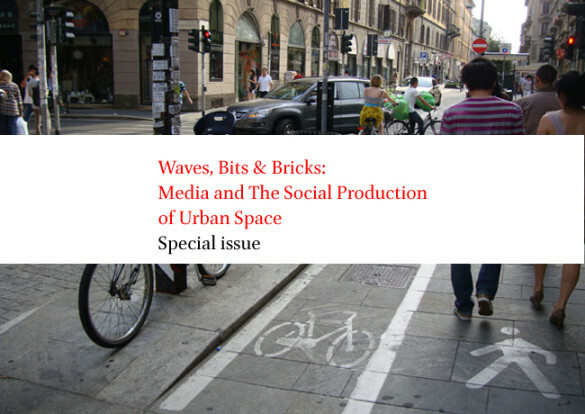 The Mobile City contributed a paper to the very interesting special November 2013 issue of First Monday called “Waves, Bits & Bricks: Media and The Social Production of Urban Space“. How has media affected cities in real, concrete terms? How do “bits” and “waves” become “bricks”? This large special issue, edited by Matteo Tarantino and Simone Tosoni, collects 15 papers by Giorgia Aiello, Thomas Apperley, Joshua Breitbart, Greta Byrum, Roderic N. Crooks, Michiel de Lange, Martijn de Waal, Sophia Drakopoulou, Leopoldina Fortunati, Lee Humphreys, Dale Leorke, Tony Liao, Didem Ozkul, Pietro Palvarini, Cesare Silla, Sakari Taipale, Federica Timeto, Simone Tosi, Shenja van der Graaf, and Wim Vanobberghen, all examining the ever evolving relationship between cities and digital media.